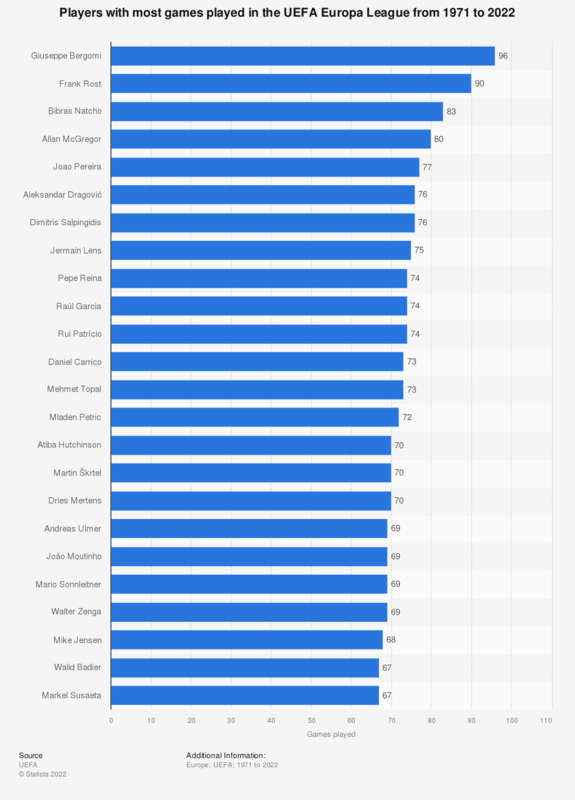 This statistic shows the soccer players with the most appearances in the UEFA Cup / UEFA Europa League from its inaugural season in 1971 to December 2018. Guiseppe Bergomi has played the most matches in the competition to-date, making 96 appearances, all for Inter Milan. * Previously called the UEFA Cup, the competition has been known as the UEFA Europa League since the 2009–2010 season. Information valid as of December 14th, 2018. Statistics include qualifying and play-off matches. Everything On "UEFA" in One Document: Edited and Divided into Handy Chapters. Including Detailed References. How much are you interested in the UEFA Europa League?